CAMP LEJEUNE, N.C. (MCN - 8/12/2010) — Some people put their lives on the line to help and protect others; like police officers, who enforce the law and fight crime. Some people take it a little further and join the armed forces, swearing an oath to protect and defend the United States. Among those, there is a select group that takes their duty beyond the ordinary, risking their own lives to protect those who protect us. “Explosive Ordnance Disposal stands as one of the hardest jobs in the Marine Corps,” said Brig. Gen. Michael G. Dana, the 2nd Marine Logistics Group commanding general, who presented three Marines with EOD Company, 8th Engineer Support Battalion, 2nd MLG, the Bronze Star Medal with a Combat Distinguishing Device during an award ceremony Aug. 10 aboard Camp Lejeune for actions during their deployment to Afghanistan from May 2009 to October 2009. Gunnery Sgt. Eric J. Gonzalez, who was also named EOD technician of the year by the Marine Corps Engineer Association, earned the medal for actions during his deployment in support to Operation Enduring Freedom from May 2009 to October 2009. Marines with Explosive Ordnance Disposal Company, 8th Engineer Support Battalion, 2nd Marine Logistics Group, were awarded the Bronze Star medal with a Combat Distinguishing Devices and a Meritorious Service Medal during an award ceremony aboard Camp Lejeune, N.C., Aug. 10, 2010. Brig. Gen. Michael G. Dana, the 2nd MLG commanding general, presented the awards to the Marines. enemy fire while conducting combat operations in Nawa District, Helmand Province, during Operation Khanjar. His dedication to duty while performing his job ensured the safety of countless Marines and sailors operating in the area along with Gonzalez, Gunnery Sgt. Drew B. Jordan received the Bronze Star for actions during the same deployment. Jordan led his team in 164 missions involving the recovery and disposal of 91 IEDs. Jordan also developed a database of IED locations and common enemy tactics that proved indispensible for units operating in Afghanistan, saving countless lives and millions of dollars worth of equipment. 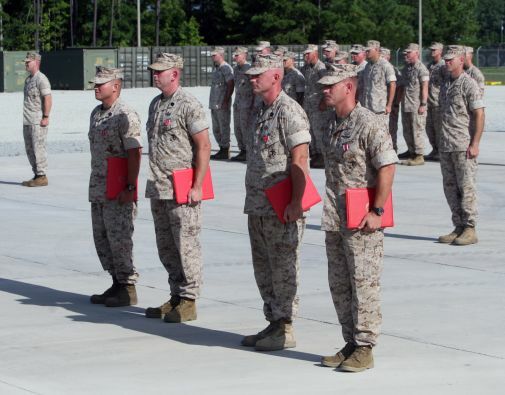 Another Marine to receive the Bronze Star was Gunnery Sgt. James P. Otto, who, while exposed to enemy fire, cleared IEDs from the canal roads so support-by-fire vehicles could continue forward. Recognized along with the gunnery sergeants was Capt. Gregory E. Wrubluski, who received the Meritorious Service Medal for outstanding service while serving as an EOD officer with the 2nd Marine Special Operations Battalion, U.S. Marine Corps Forces, Special Operations Command from May 2007 to May 2010. The passion these Marines feel for this important, yet dangerous military occupation is a key ingredient to the success of the mission. “I do my job the best I can because I like to help people do what they need in order to walk away from an IED,” Otto added. "This is a team effort. I was recognized like many others, but without the help of all the Marines I worked with I would not be able to complete the mission," Otto concluded.